In celebration of Peppa Pig’s 10th Anniversary, Character Options launched the Chatterbox Peppa Pig plush toy that stands 31 cm tall. Kids just have to press the concealed sensor inside her hand to make her face and big heart light up in a lovely soft glow. Featuring Ani Mei technology to control the lighting-up electronics, Chatterbox also speaks a selection of authentic phrases from her TV shows. Little boys and girls both adore Peppa Pig and her many adventures. 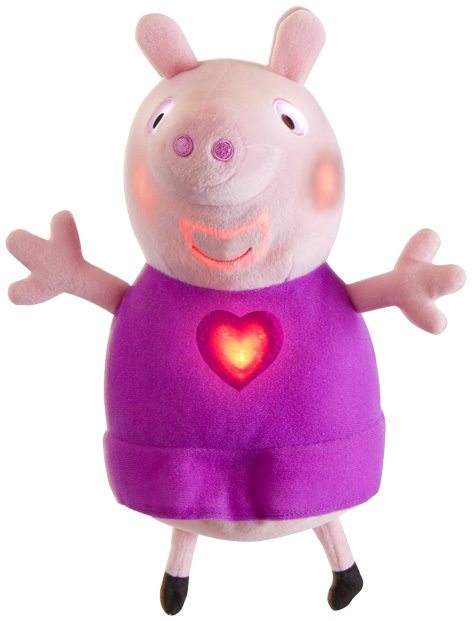 This lovable toy will give them hours of cuddling fun listening to her talk and watching the lights alternate with her voice. This hero toy is part of a much bigger range of Peppa Pig products that also include the Theme Park Balloon Ride set, a selection of Peppa Muddy Puddles toys and the fantastic range of wobbling Weebles characters. Please tell us what you think of the Peppa Pig Chatterbox by Character Options.